Afternoon Tea at Margo's Lounge at Margo's Lounge01493 653885work Coffee Morning/Afternoon TeaMargo's Lounge in Gorleston-on-Sea, near Great Yarmouth serves afternoon tea on Fridays and Saturdays 3pm-5pm. 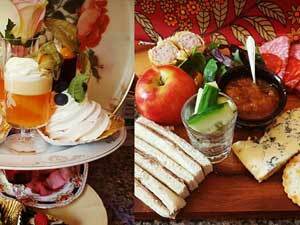 Enjoy a selection of sandwiches, a cheese or fruit scone, a trifle or posset and a meringue. Contents will vary depending on what has been made on the day. Enjoy with tea for £12.50 per person or with Prosecco for £15.50 per person. The savoury option will include something along the lines of sandwiches, cheese scone, selection of meats and and cheese & biscuits. Available with tea for £12.50 per person or with a beer for £15.50 per person. Margo's Lounge in Gorleston-on-Sea, near Great Yarmouth serves afternoon tea on Fridays and Saturdays 3pm-5pm. Only available on Fridays and Saturdays 3pm -5pm.